TV SERIES — New Rule Productions, Inc.
Delivering a national television series to the network, on time an on budget, while maintaing a creative and entertaining episode every time, is no small feat. The New Rule Productions team have the experience needed to deliver critically acclaimed episodic production. We are always working on new programming to engage, entertain and educate our audiences. We work tirelessly to utilize the most efficient techniques, technology and equipment to create the best program possible. Under the helm of director, and executive producer Ryan Johnson, New Rule Productions created the first docu-reality show about NHRA professional Nitro Drag Racing. From the ground up NRP created a series that gives viewers an intimate behind the scenes view of the world of professional drag racing. Ride along as we join some of the best racing teams, including World Champion Top Fuel Dragster driver Tony Schumacher and Champion Ron Capps and his Nitro Funny Car Team. 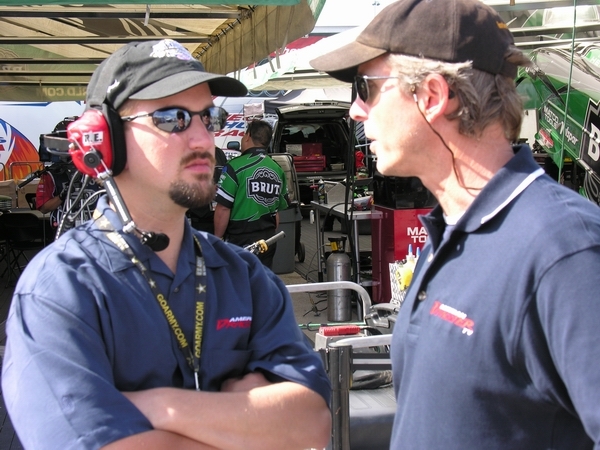 We worked closely with the NHRA and with ESPN to create the successful show. Check out episodes of our national TV series American Dragster which aired on ESPN network. "The Edge" TV Science Based Television with an Attitude! When a culture believes anything they hear, makes decisions based on anecdotes and leads lives based on information that's sketchy at best, programming that seeks to uncover the real truth behind the claims is a sure bet. The Edge brings together the Dream Team of Science to examine claims that affect our popular culture. Preview clips from The Edge a high energy science program that aims to use critical thinking to combat pseudoscience. Townies is a multi-episode series that explores the quirky lives of 20-somethings in a small town, where nothing is exactly how it seems. Coming soon, a closer look at the production that combines cookies, hipsters and a dumpster diving freegan.